Jekyll and Hyde is the well known story about a doctor who is a genius who discovered a potion that can turn him into a powerful monster. Little did he know that this monster will have a mind of its own, and it even has its own name, Hyde. This is why he was known for having a good personality when he is Dr. Hyde and an evil monster when he drinks the potion and turns into Hyde. 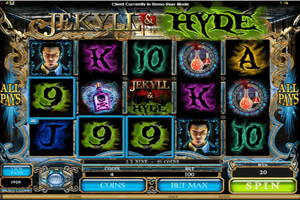 Play Jekyll and Hyde Slot here. The game is themed around the story of that doctor, which explains the name of the game. On top of that, all of the symbols and the visuals of the game are inspired by the theme. This is why the icons include Dr. Jekyll, the monster Hyde, the magical potion, the fiery wild symbol, the logo of the game and Dr. Jekyll’s love interest. The game has five reels and it has the high paying All Pays format which means that players will have plenty of winning chances whenever they spin the reels of the game. The game’s logo is responsible for activating the free spins bonus round of the game which can be quite rewarding, as for the Fiery Wild symbol, it will simply replace all other icons on the reels of the game in order to help players in getting paid.